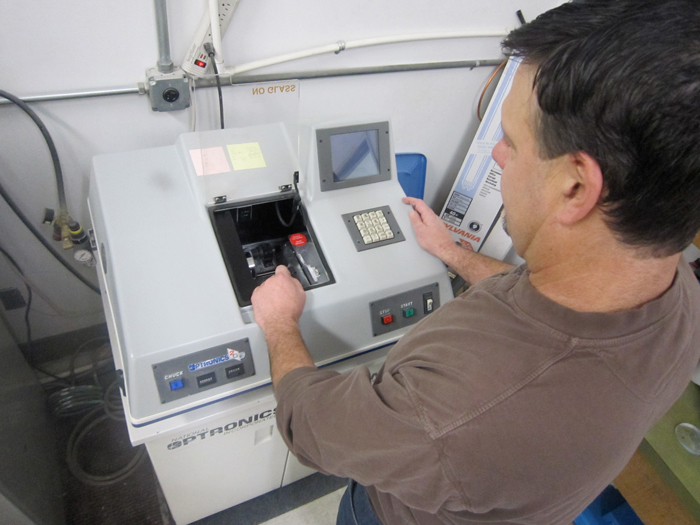 We own and operate our own full service optical lab which allows us quality control and a quick response time. With so many lens styles and material choices on the market today, it is not always easy to know which lenses will best meet your needs. Rest assured that we will take the time to answer your questions and let you know about the styles, functions, and choices, as there are many. Single vision lenses have one, consistent focal power to correct a single vision condition. Bifocal lenses have a very distinct line dividing a reading area from distant viewing. Trifocals are lenses that have three regions which correct for distance, intermediate (arm's length), and near vision. Progressive lenses corrects more than one vision condition, with its focal power “progressing” from top to bottom. Specialty lenses can be made for a variety of situations such as computer, music, shooting glasses, golf etc. Lenses are shaped by diamond tools to achieve minimal distortion. We can manufacture lenses that block UVA, UVB, and harmful blue lights. We can add scratch resistant coatings, anti-reflective coatings and more. In a crunch? We can make standard lenses in the same day to get you up and running again. Please call us to find out if your prescription is something we can turn around.